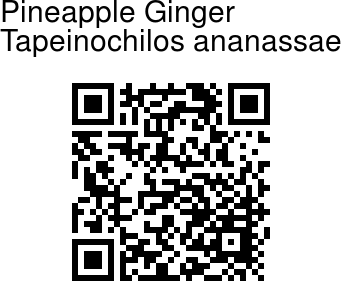 Pineapple Ginger is a herbaceous plant with underground rhizomes and grows to about 2-4 m tall. Leaves are dark green, arranged spirally around the stems, measuring about 35 cm long and 15 cm wide. Stems are herbaceous, bamboo-like. 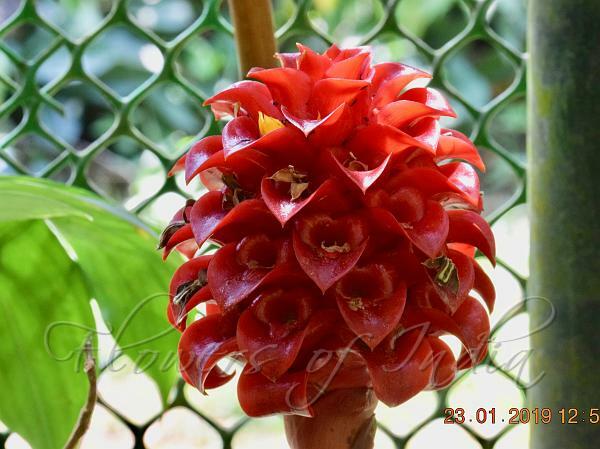 Flower clusters look like inverted pineapples, with dark red cone-shaped bracts enclosing yellow flowers. Fruits are cone-like, red bracts which will slowly turn to brown. Pineapple Ginger is found in Maluku, New Guinea, Queensland, grown as a houseplant elsewhere. Identification credit: S. Kasim Photographed in JNTBGRI, Palode, Kerala.